R: On July 9-10, Alex and I participated in “Take Off Your Clothes!” clothing swap event at Place-des-Arts as volunteers and swappers…starting bright and early at 6:30 in the morning. A: Our second year doing it. It keeps getting bigger. R: Here’s some background on the S.W.A.P. Team – created in 2007, it is run entirely by volunteers and has chapters in Montreal, Calgary, Halifax, Toronto, Ottawa and Boston. The team’s goal is to “Promote eco-friendly and socially conscious clothing consumption” and provide good quality clothing to charities, and thereby reducing landfill waste. A: So why do you swap? R: When I first read about the swap event on Facebook in May 2010, I thought it was a great way to get some new clothes without spending much money because I was really broke back then. A: For me it was part not wanting to buy new clothes, and part curiosity. I had never heard of clothing swaps and had no idea what it could possibly entail. New clothes didn’t hurt either. R: The S.W.A.P. team puts a lot of effort into making the venue look nice and like a “boutique” (laying out the clothes on tables or hanging them on racks), which helps to attract those who feel wary about used clothes. A: You’ve been to smaller scale swaps too, right? Does it actually make a difference in the swap experience, and do you think a swap’s quality is proportional to its size? R: It does. I’ve participated in one “chaos” style swap where people just piled on clothes on top of each other. I used to think the whole “boutique” set-up was superfluous, but after the overwhelming experience of the “chaos” swap where I had trouble finding a matching glove, I’ve come to appreciate the organization. 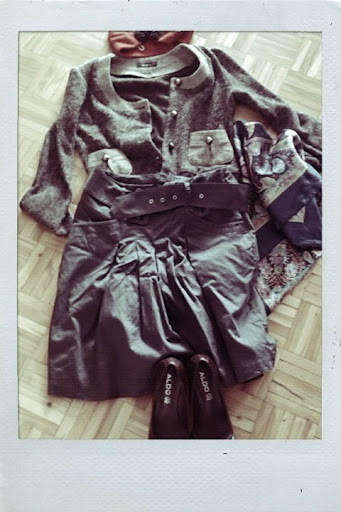 Rosel’s Swap Finds – Almost An Outfit! A: I agree that “authenticity” that the S.W.A.P. Team provides makes the fact that someone was wearing the clothes before you more palatable. R: Yeah, I agree. the S.W.A.P team also has pretty strict standards (no tank tops, no t-shirts, etc) which I think is fair – I certainly wouldn’t think a tank top and a winter coat were worth the same ticket. A: Do you think that the format of the S.W.A.P. Team event is an ultimately useful one? I mean, does making the swap more like a boutique store just reinforce the norm of shopping, or does it subvert it somehow? R: I find the $10 admission fee to the events a bit problematic. One man who was walking by Place des Arts asked, ‘you have to pay $10 to just exchange your clothes?’ and I didn’t really have a good answer. It seems counter-intuitive to charge for an event that promotes more affordable clothes…I mean, it’s worth it if you bring a lot of stuff. But if you only have 2 things to give away, you wouldn’t want to pay $10 to do it, would you? This makes me think that swapping is really geared to the (upper?) middle-class demographic that has a lot of spare clothes to go around. R: True. The “chic” image of the S.W.A.P team certainly did them favours – A lot of media covered the swap event this time around (Montreal Gazette, Clin d’Oeil, and other blogs). How was your experience as a male swapper? A: It gets better every year, but there’s honestly not a lot of great clothing available for men yet. I blame deep-seated gender norms; men, in general, don’t swap their clothing. Instead, they keep it until it can’t be worn anymore. R: Yeah, the male presence is definitely less prominent than the female one. A: And a proportionally more queer one. What fascinates me is that the gendered nature of clothes gets blurred outside of the store setting. When the clothes get sorted they aren’t labelled “men” or “women”, so you sometimes find women’s clothing in the men’s section. I took a great jacket home from a men’s rack and it was for women. Speaking of clothing adventures, did you unearth any great clothing treasures? R: I received 25 tickets and picked up 11 items – mostly skirts and dresses, some scarves, and two pairs of shoes. What I’m most excited about is a red turban-style knit headband for the winter – I think it was donated by one of the vintage shops they partnered with, since it still had the “$18” price tag. How about you? A: Aside from the jacket, a pair of dress pants and a brand name sweater. I even saw one of my own shirts and took it back. I guess that speaks to how much we want a piece of clothing by how it looks on a hanger. Oh, and a fedora that the resident stylist insisted I take. R: Yes, the resident stylist by the change room was very enthusiastic about everyone’s finds…including a dress that was definitely too short for me (which he dubbed a “walking dress”). A: So do you think more people should start swapping? I think it depends on their gender identity… guys should test the waters, but there’s tons of good finds for women. R: I say yes, women should definitely try out clothing swaps. It is a great alternative if you want to a) save money and b) explore alternative and more ethical ways of buying clothes. The S.W.A.P. team has another event coming up in September. A: Wait, I changed my mind! Isn’t the lack of men an issue at these things? We should be telling more men to jump in whole heartedly! Guys, get involved! I love clothing swaps! I used to have clothing swap parties in college where I would just invite everyone over and we would eat and drink and try on other peoples clothes. I feel like it is easier for me to let go of things, to let go of the nostalgia and attachment when I see other people really enjoy a garment. When I take it to a thrift store or donate it I don’t get the same feeling of allowing myself to let go. Our attachments to clothes are fascinating. Oddly, I think I prefer the anonymity that a huge clothing swap allows. I want other people to enjoy the clothes I donate, but there’s a part of me that wants to never see that firsthand. Maybe I just don’t want to see someone pulling off my clothes better than I could. Regarding the kinds of swaps, it really depends. I went to a clothing exchange with a small group of women where everybody was relatively the same size and very stylish, so I walked out with lots of good stuff and felt very positive about the experience. But smaller swaps can be a huge miss if people’s styles aren’t similar.